As the Christian Science movement goes forward, many questions about the early Church remain unanswered — especially the question, Why did Mrs. Eddy create a Church with a self-perpetuating Board of Directors? Her reasons for doing this are fully given in William Lyman Johnson’s History of the Christian Science Movement. Because most books about the early days of the movement focus on Mrs. Eddy’s life, they do not give a thorough account of the events that took place in Boston when she was there, and after she moved to Pleasant View. In biographies about her, various names of those associated with her are mentioned, but a full report of their roles in these eventful years is missing. Why did she disband the Church and Metaphysical College in 1889? Why did she reorganize the Church with a Board of Directors that could appoint their own successors? Why did Mrs. Woodbury and Mr. Nixon pose such a threat to the Cause? These questions and many others are answered in Mr. Johnson’s History. He focuses on the people, events, and circumstances in Boston and elsewhere from around 1886 until Mrs. Eddy’s passing in 1910. He was not so concerned with Mrs. Eddy’s life as he was with the work being done in Boston to establish the Cause and build both the original Church edifice and the extension. Lyman Johnson’s father, William B. Johnson, was one of the first four Directors of The Mother Church. His father worked closely with Mrs. Eddy from the time he went through class with her in 1886 until her passing in 1910. Lyman was a student in high school when his father took class. He was at his father’s side throughout the years that the Church going through great changes, assisting him in the endless work involved in first disbanding the Church and organizations in Boston, and then later in reorganizing the Church and building the original Mother Church. He knew firsthand the many personalities in Boston and elsewhere working for or against the Cause as Christian Science became a worldwide movement. We today would know very little about the power struggles, the cliques, the rivalry, the dishonesty and plagiarism, the envy and jealousy of those who tried to emulate or destroy Mrs. Eddy’s Cause, if it were not for Mr. Johnson’s firsthand account of these events. Drawing on his own experiences, his father’s diary, the archives of The Mother Church, and other documents, he has left us a priceless heritage — a factual record of these early years of the Church. He also describes his own awareness of the historical events taking place as he experienced them, the part he and his father had in making them happen, and how moved he was by them. In reading the History one is deeply touched by the tireless and unquestioning loyalty that these few early workers had for Mrs. Eddy. For many years, as she weathered every kind of abuse, desertion, disloyalty, and the many attempts of ambitious students to take over the Cause, this little band of workers stood beside her, ready to follow her lead in whatever direction she took them. He describes the personalities and motives of Mrs. Eddy’s opponents, and reveals the spiritual genius she expressed in maintaining control of her Cause when establishing The Mother Church as she did. Her motive was to protect Christian Science from those trying to take control of the movement and promote their own views of Science, or create a rival movement by plagiarizing her works. The History gives us a much greater appreciation of Mrs. Eddy as Leader, whose God-directed actions enabled her to out-maneuver and prevent others from using the movement for power and monetary gain. The need to establish The Mother Church as she did becomes obvious. Under the circumstances, she had no other choice. Mr. Johnson tells of the building of the original Mother Church and the extension. He explains why certain By-laws came to be written, how the Lesson-Sermons and the Wednesday Evening Meetings came about. He tells how the presentation of Christian Science at the Parliament of Religions in 1893 was a great turning point in the movement. Among the highlights of the History is an assessment of Archibald McLellan’s role as Director, and how he forced Lyman’s father to resign from the Board. Mr. Johnson concludes with a description of Mrs. Eddy’s passing and her funeral. Mr. Johnson’s History itself has an interesting past. Starting in 1919 and continuing for six years, Mrs. Mary Beecher Longyear asked Lyman Johnson to write accounts for the Longyear Foundation on certain subjects in the history of the movement. Apparently, as Mr. Johnson covered different subjects, new questions arose about which Mrs. Longyear wanted more information, and further essays resulted. Thus, Lyman Johnson’s history of the movement to 1910 was not written in chronological order, and there was much duplication of information within his completed work of over a thousand pages. Part of the Thousand Pages, as the text came to be known, was given by Mrs. Longyear to an editor who prepared for publication the parts dealing with the period up to the dedication of the original Mother Church in 1895. This material was then published in 1926 as two volumes, called History of the Christian Science Movement, by Contemporary Authors. These volumes appear to have been immediately suppressed — presumably by Church authorities — for they were never circulated. It was not until 1933 that Lyman Johnson read copies of the two edited volumes, and he objected to the way his work had been pruned, added to, and arranged. The remaining pages were returned to him, but were never published. In 1988, The Bookmark was able to obtain copies of the Longyear volumes, but it was not until 1999 that the missing pages, completing the thousand pages, became available. The photocopy of the original Thousand Pages was not of good quality, and there are inevitably some gaps in the text. Editing has been kept to a minimum. The History is being presented as two transcripts. 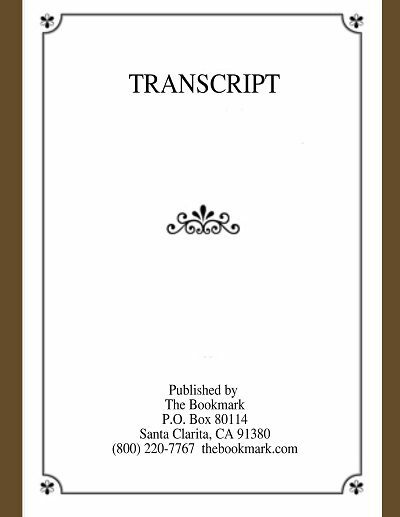 The first transcript includes the two Longyear volumes, and the second transcript includes the Thousand Pages as they came to The Bookmark. As we read this record of the movement by someone so closely involved with all that took place in Boston, we begin to understand the reasons why the Church was reorganized, the By-laws written, and the board was made a self-perpetuating board under our Leader’s supervision. Because we today are so far removed from the events that took place when the Church was formed, we have very little information regarding the obstacles Mrs. Eddy had to overcome in order to insure that her discovery would not be adulterated and lost after she left us. Mr. Johnson gives us such a discerning account of these events, that his History will serve for centuries to come as a priceless record of the early Church by one so capable of appreciating these events and recording them in such detail.